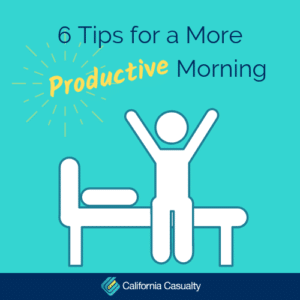 If getting out of bed early to get ready for work leaves you feeling groggy, we have a few tips to get you energized for the day and to help you get into the habit of a healthy a morning routine. According to ABC News, a recent survey found that 20% of U.S. population is consistently late, especially when it comes to work. Being late isn’t just about time, but could be affecting your mental health. Studies show that procrastination is a link to anxiety, low self-control, and more. Plus, the stress of feeling rushed in the morning can lead to feeling like you are running behind for the rest of the day. If you want to make a change and make your mornings more productive, follow these simple steps to establish a morning routine. Prepare the night before: Take 10 minutes to lay out clothing, lunch, and other things you may need throughout the day. This saves time in the morning for other tasks – especially the unexpected ones that tend to require time and attention. Set an alarm or reminder to go to bed: Whether you feel and do your best after 4 hours of sleep or 8 hours of sleep, setting a reminder when it’s time for you to hit the hay will help make sure you get the sleep you need at night to have a productive next day. Track your habits: Use an online app or keep a written sleep journal. Identify things that occur during the day/evening that may make it harder to fall asleep or cause a restless night. As you start to see patterns, make the adjustments you need to get a full night of sleep or that give you the time you need in the morning. Eat a healthy breakfast: Your metabolism slows while you are sleeping. Give it the morning boost it needs with a fast and easy meal with the proper balance of protein, carbohydrates and fat. Plan to be early: Tack on a 15-minute cushion at the beginning of your day. Whether this means setting your alarm early, giving up a tap or two of the snooze button or prepping breakfast the night before, you’ll feel less rushed or anxious throughout the day. Keep your morning routine going on your days off: Continuing to go to sleep and wake up at the same time each day will help keep your body on track physically and mentally. You only get 25,000 mornings in your adult life. Even if some of your days have passed by in a sleepy fog, there is no better time than today to make a positive change. Be sure to make the most out of your mornings and days. Starting a morning routine will eliminate stress, and make you feel better as a whole, inside and out. New Year, new you. Right? That’s what everyone says. Statistics say that 80% of resolutions fail by February. Start 2019 with a new goal and achieve what you put your mind to. Here are some simple steps to keep from feeling overwhelmed and help you stick to your new year resolution. Keep it simple. If your plan is to lose weight, figure out how much you want to shred and then divide that into twelve months. This helps break down a long term goal to small accomplishable goals. Accountability. You are more likely to keep at your resolution if your goal is reinforced and encouraged by others. Rely on your support system for the hard days when you’re tempted to give up. Track Progress. Include an easy way to track your success to match your goal. A vision board or a journal are some great examples to use. Celebrate the wins. Make sure positive recognition is a part of the process. Praise can go a long way. Small stumbles will happen. It’s important to remember that bumps will come along the way. That doesn’t mean that you have failed. Write it down on your progress tracker and understand it as a learning lesson. As we ring in the New Year, just remember that you can accomplish what you set your mind to and you have support along the way. Change takes time and patience. Don’t forget about your support system along the way. Even the most attentive and caring parents make mistakes – including accidentally leaving or locking a child in a car. And sometimes, children climb into unlocked, parked cars in the driveway without parents realizing they have done so. Regardless of how it happens, children left in hot vehicles are in grave danger within a matter of minutes. No exceptions: No matter how brief your errand or how quick your stop, NEVER leave a child in the car. Under any circumstances, even with the windows cracked or completely rolled down. There is no safe amount of time to leave a child in the car. Get involved if you are a bystander: If you see a child alone in a hot vehicle, call 911 immediately. If they are in distress due to heat, the National Highway Safety Administration recommends getting them out as soon as possible. Remind Yourself: Oftentimes, child car seats are behind the parent’s seat, out of sight. Tell yourself out loud to remember the child; give yourself visual cues; place your purse or briefcase in back by the child- so when you go to get it when exiting the car, you are reminded; place the diaper bag in the seat next to you where you can see it; place a stuffed animal in your child’s car seat- move it to the front seat next to you when the child is in the car. If you are changing up routine (for example, if Parent 1 usually drives the child in the morning, but today Parent 2 is doing so), it is easy to forget. New parents have a lot on their minds. Remind, remind, remind. Prevent kids from wandering into the car: Don’t let children play in your car unattended. Lock your car doors and trunk, and keep keys out of any child’s reach. That way, you minimize the risk that they climb into your car without you knowing they have done so. Make it routine: Make it a habit to physically open the back car door and check for anyone left behind every single time you get out of the car. Have back up: Make arrangements with your child’s day care center or babysitter that you will always call if your child will not be there on a particular day as scheduled. That way if you forget and they are absent, they will alert you. For more car safety tips, visit the National Highway Safety Administration. Now that the day-to-day job is in the past, you can look forward to a life afterwards. So you maybe asking yourself, what to do now? It’s a new chapter in life and the opportunities are endless. Here are ideas to consider for your new life in retirement. Staying Active. Gardening, playing tennis, taking walks, or even chasing grandkids are great ways to keep active throughout retirement. It also has health benefits such as reducing cholesterol, promotes stronger bones, helps improve strength and balance. Find Your Creative Side. It’s important to also exercise your brain. Studies show that picking up a hobby has positive effects such as reducing your risk for Alzheimer’s. So pick up that paint brush and paint a masterpiece, or strum a new song on the guitar. Get to Know Your Friends. Now that work doesn’t interfere with your social life, take time to spend more time with friends, or even family. It doesn’t just help bring everyone together, but it has cognitive benefits, such as happiness. Who doesn’t enjoy an afternoon with friends? Spend Time Volunteering. Put it on your schedule to do volunteer work. Volunteering helps with your mental health bringing happiness and personal satisfaction. Going into retirement doesn’t have to feel like the end of the world. Think of it as a new open door to life. Staying healthy and happy will lead to a longer enjoyable life. If you have a dog or cat, you know what a joy they are. Their love and loyalty enriches our lives. Many families also have therapy and companion dogs to warn about food ingredients someone may be allergic to, while others can warn diabetes patients when they are suffering from low blood sugar. And, knowing that your dog loves to take trips with you to dog parks, hiking trails and other dog-friendly areas, California Casualty now includes coverage with every auto policy* that pays for vet bills if Fido or Rover gets hurt in a covered auto accident.